Road salt is the most common deicer used to promote safe motor vehicle travel during winter months. The most commonly used road salt is sodium chloride, which is readily available, inexpensive and effectively melts snow and ice. However, after more than half a century of widespread use of road salt in North America, environmental and scientific communities have begun to notice the impacts of road salts on water quality, soils, vegetation and wildlife. Chloride concentrations have increased in the Croton System reservoirs, a drinking water source for many Westchester residents, due to increased use of road salt. This has an effect on its taste and an impact on human health. Exposure to salt may kill some healthy soil bacteria, thereby prompting potential changes to soil structure, altering microbial animal populations, and impacting the plants that depend on both the bacteria and microbial animals. Elevated levels of sodium and chloride in the soil inhibit water and nutrient absorption which leads to long-term growth inhibition and direct toxicity to plant cells. Damage to vegetation degrades wildlife habitat by destroying food resources, shelter, and breeding or nesting sites. Road salt can have direct toxic effects on the birds and mammals that drink snowmelt or eat road salt, and it can attract white-tailed deer thereby contributing to potential collision with motor vehicles. Given the environmental impacts, salt is still a necessary and generally accepted part of the winter environment. It provides safety and essential mobility for motorists, commercial vehicles and police, fire and other emergency vehicles. In fact, if responsible agencies fail to keep their roadways clear of ice and snow, they can be sued. Read more about salt from the Salt Institute. While municipalities are legally responsible for providing passable and reasonably safe roads, they cannot always produce bare pavement directly after a snowstorm; therefore, we need to work together in order to understand the connection safe winter driving, salt usage and water quality. To address these issues, the Northern Westchester Watershed Committee has created a Highway Deicing Task Force whose mission is to provide for the safety and welfare of the traveling public while protecting natural resources through best management practices. 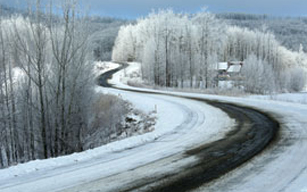 Read the November 2007 Highway Deicing Task Force Report. When you see an extreme forecast, plan ahead. Talk to your employer, local school or daycare center. Check road reports, forecasts and roadway temperatures at the New York State Department of Transportation Traveler Advisories. During heavy snow storms, residents should stay off the roads. Plowing becomes more difficult when there is traffic on the road. If residents must travel, they should make every effort to use major thoroughfares that have been plowed and/or treated with salt. Emergency groups encourage you to have supplies that will last three days. You should keep your vehicle in top operating condition all year round for safety and fuel economy. Read your owner's manual and we encourage you to read and print Winter Driving Tips. You cannot drive at normal highway speeds during a winter storm event. SUVs are not any safer in snow than other car although people drive them as if they are. Your car should be parked in your driveway so that the plow has access to your street and can the road. A little salt will keep snow and ice from bonding to the pavement by salting before snow has accumulated. Salt should not be used to melt every bit of snow and ice. Use only enough to break the ice/pavement bond, and then remove the remaining slush by plowing or shoveling. When clearing the end of the driveway, place snow to the right to prevent it from being plowed back into the driveway. Do not pile snow in areas that will block or obscure a driver's view of the roadway and oncoming vehicles. This causes a dangerous situation for motorists who are driving on a plowed road and unknowingly hit blocks of snow placed out in the road.